BIG FISH ON guides for stripers on Lake Lanier in the Metro Atlanta area. Stripers are available year round. We also guide for trophy stripers through out GA and TN. 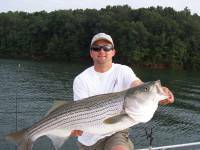 Full time striper guide service on Lake Lanier. Fishing reports updated weekly. Lake Lanier is the premier striper lake in Georgia. Inshore and Offshore fishing trips on the Georgia Coast. We target most species and offer 20 years experience and year round charter fishing trips. A premiere light tackle inshore fishing and sight seeing company. Fish the waters near Savannah, Tybee Island and Hilton Head for redfish, seatrout, flounder, shark,tarpon as well others species. All skill levels welcome as well kids! Inshore and Nearshore fishing charters,serving St.Simons Island,Georgia.Capt.Richard Latham has been fishing St.Simons for over 30yrs. One day fishing trips 8, 10 fishing hours, Georgia Coast, Georgia Lakes, Florida Coast, Gulf Of Mexico, Panama City Beach Florida, Roundtri caoch depart atlanta and georgia Metro Areas to Fishing Boats and Beach Outings, Seasons january thru December, Sunday thru saturday trips, Review fishing from georgia videos, Accepting Reservations Online www.fishinggeorgiaflorida.com or call 770 502 9560, Enjoy a memorable experience. Lake & Stream Guide Service is a year round professional fishing guide service based in Ellijay, GA. We offer personally tailored guided trips on Carters Lake, Lake Blue Ridge, Lake Nottely, the Coosawattee River, the Toccoa River tailwater and a number of trophy-managed private trout streams throughout the region. Lake & Stream specializes in catching BIG fish on light tackle. Safety and client comfort are paramount for us. Our mission is to provide every client a fun-filled day of fishing, while experiencing the beauty of the North Georgia area lakes and streams. Guided trophy sportfishing for giant stripers and bass on legendary Lake Lanier, Georgia. Customers have taken 43 pound stripers, almost 12 pound largemouth bass, and near State record spotted bass. 28 years of professional guide service operation. All equipment provided, gift certificates available. Near Atlanta, open all year.